A recent study in The Journal of School Health finds that the most common gateway drug is not pot, like most people tend to accuse. The ultimate gateway drug is in fact the most pervasive drug in our culture: alcohol. Developing a “Gratitude Attitude” enables us to find the positive in those situations we perceive as being negative, says self-help author. Sit down at any table this Thanksgiving and chances are you will hear some variation of the above statements. After all, it’s easy to recognize positive outcomes and express our appreciation for them. But recognizing and appreciating the good in those situations we perceive as negative is more difficult, or at times, downright impossible. That’s where a “Gratitude Attitude” comes into play, helping us focus on what we gain from every occurrence in our life, says Nancy Christie, author of The Gifts of Change (Beyond Words Publishing). The Gifts of Change explores the idea of seeking out the good in all situations. In the chapter entitled “The Hidden Advantage of Hindrances,” Christie uses a quote from Elizabeth Kübler-Ross to illustrate the choice we all have when confronted by difficult experiences. 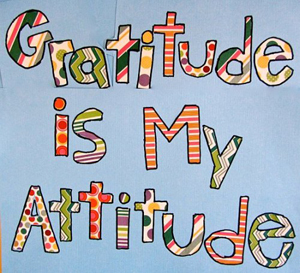 Knowing how difficult it can be to develop a “grateful approach” to life, Christie has created a “Developing a Gratitude Attitude” worksheet as part of the Workbook for Change available atwww.communityofchange.com. Need help making a change? Visit the Community of Change site for tips and strategies or to sign up for a “Rut-Busting” Workshop!